My buddy and I lit out from Fort Lauderdale at around 1am this morning. 16 hours later, after sharing driving duties, we checked in to the Quality Inn in Petersburg Virginia. 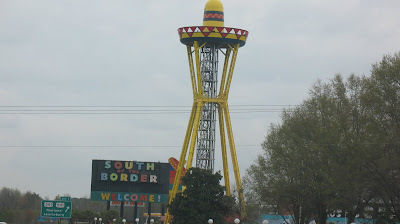 It was a fairly unevenful ride, in fact a tad boring save when each of us started to nod off during our stretch at the wheel. One remarkable thing was the billboards in the sky. These things are mounted on huge metal poles up so high in the air I think they're used to attract low-flying objects as well as cars. And then, before you know it the mecca of kitsch is upon you. 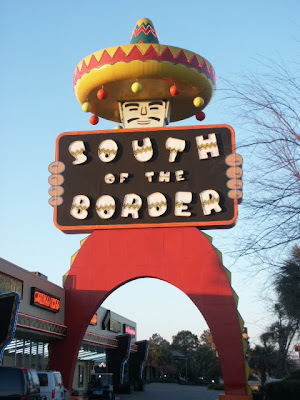 I have got to visit this place next time I go across the border. Looks awesome! Oh man, thanks for this. We used to play the same game with those signs when I was a kid. I couldn't believe the letdown of the actual place after all that buildup. It was my first lesson in hype. 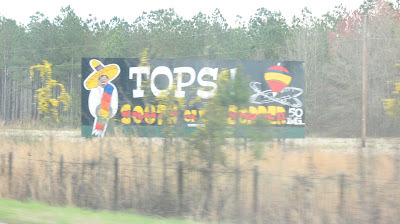 We live in central florida, my MIL lives in NC.. when we go to visit her, I LOVE watching for those signs. 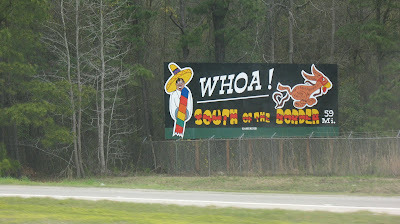 My favorite is the car flipped upside down on the sign. They never get old for me... they might though, if we ever stop to see the place. 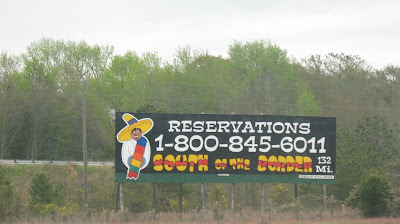 The funniest sign of all is the one just past South of the Border. It said something to the effect that you just missed it. As if that was at all possible. You figure that they could just hire illegal immigrants to hold up sandwich boards. Mary: You mean take a trinket trek? Shawn: Memories are made of kitsch. Dizzblnd: Pedro's a rock star! DOM: Yeah, good one. My fave's You never suasage a place - Everyone's a weiner. Jenn: Canada's got a few crazy landmarks: The "Big Nickle" in Sudbury, Ogopogo in B.C. and Potato Head in Fredericton are 3 that come to mind. Moooooog: Ya mean like from other planets? 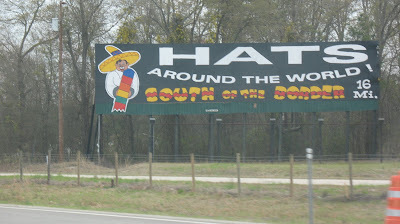 Hey, Pedro's outta this world. We even stopped to see what all the fuss was about here. Today, however, with two old farts bent on making good time.